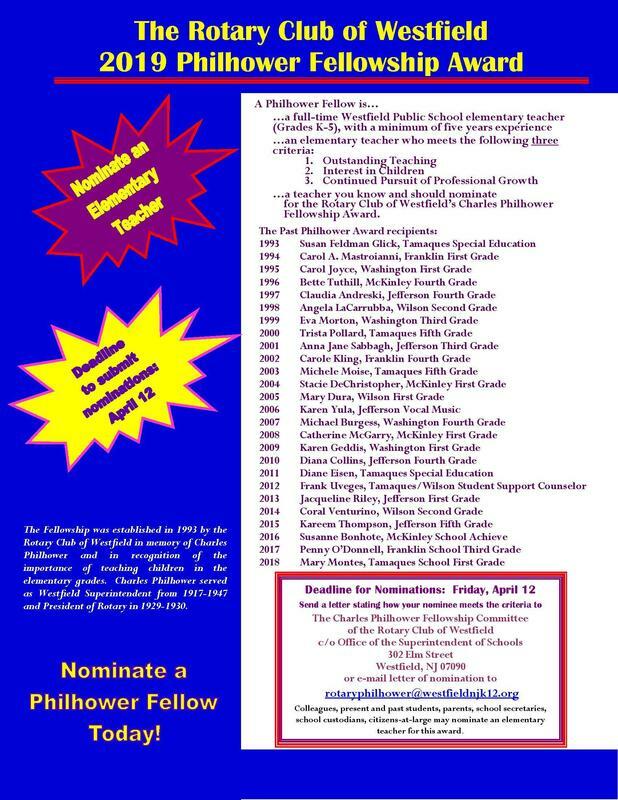 The Rotary Club of Westfield is accepting letters of nomination for the 27th Annual Charles Philhower Fellowship Award which recognizes an outstanding elementary school teacher each year. Nominations should specify ways in which the teacher has demonstrated outstanding teaching, interest in children, and continued pursuit of professional growth. To be eligible for the award, a teacher must have worked full-time in grades K-5 in Westfield for a minimum of 5 years. Nomination letters should be sent to: Charles Philhower Fellowship Committee of the Rotary Club of Westfield, c/o Office of the Superintendent of Schools, 302 Elm Street, Westfield, NJ 07090 or emailed to rotaryphilhower@westfieldnjk12.org. The nomination deadline is Friday, April 12, 2019.